Application Form for All India Law Entrance Test (AILET) 2018 has been released on the official NLU -D website. Interested candidates can read the updated information on AILET Notification 2018. Getting an admission into National Law University is dreamed by many. If you too are aiming to make a career in law and your ambition is to become a lawyer, getting into a law college would be the first step. As is the case with any other course, the institute or college from where you get the law degree is of utmost importance when building a career out of it. One of the best institutes for pursuing the law degree is the NLU (National Law University) where one can pursue the BA LLB, MA LLB as well as Ph.D. courses. Before all that, however, you will need to clear the AILET entrance examination. Clearing this examination will make you eligible for admission into NLU and all other top law institutes all over the country. For that the first step is filling up of the AILET application form. This year’s AILET entrance exam 2018 application form is already out. You might be confused or unaware of how to go about filling the AILET entrance exam application form. Here we help you with just that. A step by step guide is provided below to help you with filling out the AILET 2018 Application Form. First and foremost you will need to visit the official website of NLU (www.nludelhi.admissionhelp.com/nlu/login.aspx) and click on the tab which says “Create New Account”. A tab asking various details like your name, email address, DOB, et all will open. Fill these up as asked. Click on the link which is sent on registered email ID (it will be titled as Registration confirmation/verification). This will take you to another link. Here, click on the tab titled “Click here to Apply- National Law University, Delhi”. Once all the details are filled in, you will be taken to the last step which is the payment tab. The AILET 2018 application form cost is Rs. 3050 for the candidates belonging to the open/general category. But for those falling under SC/ST/ PwD category AILET 2018 application form fee is Rs. 1050. The payment for application form of AILET 2018 can be made through NEFT/Debit Card/Credit Card. So the process for filling AILET application form online is quite simple and straightforward. The forms have been made available for filling up online from 3rd Jan 2018. The last day for filling and submission is 7th April, 2018. Note that the application form for AILET is only available online. No candidate can fill or submit the form via any other mode. So fill it up at the earliest. We wish you good luck for the preps and for the examination! Check here the instructions to fill AILET Application Form. 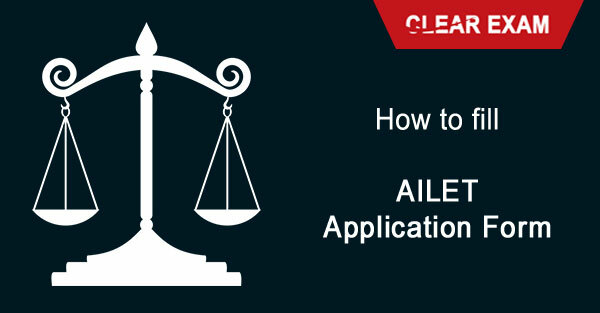 Step by step application filling process will be at your ease to fill the ailet application form.